I read this wiki page about the various returns but have some more questions. I understand the investor (aka money-weighted) return well. My question is on the portfolio (aka time-weighted) return. I started writing out an example to illustrate my question but then realized it would be easier to reference a spreadsheet. Please see here. The spreadsheet shows a simple exercise with a hypothetical portfolio consisting of two asset classes. To ensure that I understand this, am I calculating the portfolio return correctly? In my spreadsheet, I calculate this per day: (today's balance - yesterday's balance - inflows + outflows) / yesterday's balance. Then, I sum all of the percentages to achieve the YTD portfolio return. But, why stop at daily returns? Why not calculate hourly returns, or returns for every minute, second, or fraction of a second? Generally, a monthly return is sufficient. That's what mutual funds and ETFs report. That's also what the spreadsheet in the linked wiki page does using a single monthly calculation with half the cash flows attributed to the beginning, and half to the end of the month. Thanks for replying, PFInterest and longinvest. PFInterest, I'm referring to the portfolio return (aka time-weighted return or comparable return) mentioned on the wiki page I linked to earlier. Yes, good point about flows, longinvest. Also, agreed about the time period, longinvest. I put daily dates in just for illustrative purposes (I would never track my investments on a daily basis) but updated the spreadsheet to show month-end dates per your suggestion. Now, I updated the spreadsheet with the previous state in the "Previous State 1" tab and a new scenario in the "Current State" tab. 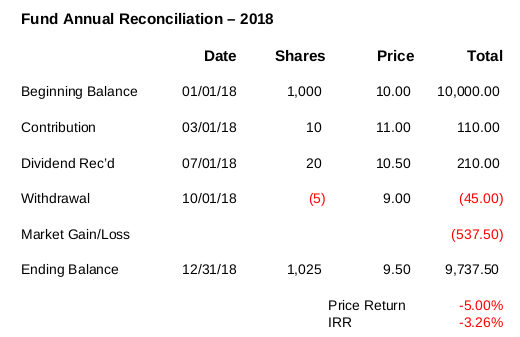 The portfolio balance rises on 1/31/18 and returns to the starting (12/31/17) balance on 2/28/18. Yet, the calculation still shows a positive YTD portfolio return of 0.99%. Assuming the calculation is correct, how can we explain that? Mathematically, I understand why the YTD portfolio is not zero. There is a gain of $110 one month and a loss of $110 the next, but the loss comes off a larger portfolio balance and thus smaller negative percentage. However, intuitively, it doesn't make sense to me that there's a positive YTD portfolio return even though the balance returned to the original balance. I looked at your spreadsheet. I see the problem. The cumulative 2-month return is incorrectly calculated. Here's how to do that. transactions. You would need a separate sheet for each asset class. Ah, good catch, longinvest. That makes sense. I corrected my spreadsheet now, and the portfolio return is 0%. By the way, I just wanted to say thank you for building and maintaining the spreadsheet on the wiki page. I created this one not to use for tracking performance but instead just to understand how portfolio return is calculated, which I do now. Thanks, patrick013, but that calculates IRR (aka investor return or money-weighted return), which I find to be less useful. I need the portfolio return to compare against standard indices. returns compared to the published figures is going to be different. But that's my reason for digging into this. Published returns are not sufficient for two reasons, right? We need the return across our entire portfolio, not just for the individual funds/ETFs we hold. For those of us that are in the accumulation phase of life, we're buying in at various times of the year. This will cause our portfolio return to diverge from the published returns of the funds we hold. Let me know if any of this is not correct. Thanks.